Kisenosato est toujours invaincu après sa victoire éclair contre son rival Kotoshogiku. 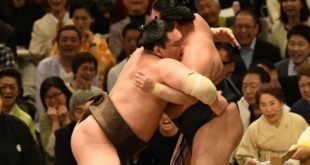 Kisenosato a remporté sa 59ème rencontre avec Kotoshogiku, un record de face-à-face entre deux mêmes lutteurs. Cette victoire gagnée en un clin d’œil lundi lui permet de conserver sa place de leader en division makuuchi. 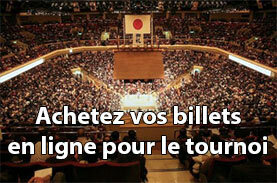 Kisenosato, seul en tête pour la première fois de sa carrière, a parfaitement exploité la charge trop basse de son adversaire pour le faire plonger au sol. Kotoshogiku n’a pas été assez rapide pour surprendre son rival. Au lieu d’attraper Kisenosato, il a préféré charger en embuscade et se mettre en danger. Kisenosato, toujours à la recherche du premier titre de sa carrière, a remporté 27 des 59 matchs disputés avec Kotoshogiku – un record dans cette division qui était détenu jusqu’à présent par Musashimaru – Takanonami avec 58 rencontres. Demain, Kisenosato affrontera Kakuryu ; l’ôzeki détient l’avantage avec un score de 29-15. 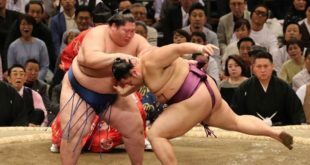 Kotoshogiku cumule désormais deux défaites se qui réduit considérablement ses chances d’être promu yokozuna à la fin de ce tournoi. Au lendemain d’un match violent où il était couvert du sang de son adversaire, le yokozuna Hakuho reste une victoire derrière le leader après s’être aisément imposé contre le komusubi Tochiozan. Harumafuji, qui lutte avec un genou droit douloureux, a triomphé du maegashira 4 Ikioi. Le japonais subi sa deuxième défaite consécutive. Après une victoire bien terne la veille où il avait combattu sournoisement en esquivant la charge de son adversaire, Goeido a montré aujourd’hui qu’il était capable de faire mieux en forçant Kakuryu à sortir de l’anneau. 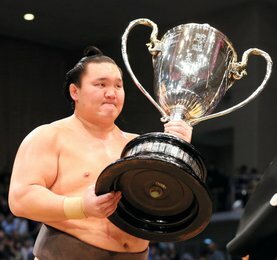 Cette victoire permet à l’ôzeki, en plus de sauver son rang en mai prochain, de rester à égalité avec Hakuho juste derrière Kisenosato. 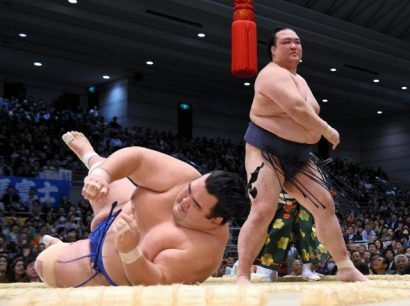 En dépit de ses blessures, l’ôzeki Terunofuji a obtenu une victoire cruciale contre le sekiwake Toyonoshima. Second ôzeki kadoban dans ce tournoi, Terunofuji est apparu physiquement incapable de faire face à son adversaire un jour plus tôt. Bien qu’en petite forme, le mongol a pu verrouiller ses bras autour de Toyonoshima et arracher cette sixième victoire. 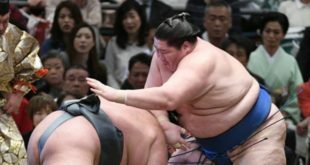 Kisenosato won the 59th edition of sumo’s longest-running top-flight rivalry in the blink of an eye Monday as he maintained his perfect record on the ninth day of the Spring Grand Sumo Tournament. Kisenosato, in sole possession of the lead at the turning point for the first time in his career, exploited fellow ozeki Kotoshogiku’s penchant for charging low on the tachiai. Kotoshogiku (7-2) wasn’t quick enough to surprise his opponent. Instead of catching Kisenosato off balance, he charged into an ambush and was easily yanked to the surface in less than a second. Kisenosato, seeking his first career championship, improved to 27-32 in their 59 career bouts — a new record for the makuuchi division. On Tuesday, Kisenosato will go for win No. 10 against yokozuna Kakuryu, whom he holds a 29-15 career record against. Kotoshogiku, the surprising champion in January, is eyeing a second career title that would likely earn him promotion to yokozuna. But with two losses under his belt and a two-win gap between him and Kisenosato, those chances are now looking increasingly slim. A day after a violent match left him spattered with his opponent’s blood, yokozuna Hakuho (8-1) stayed one win off the pace with a straight-forward victory over komusubi Tochiozan (2-7). Yokozuna Harumafuji (7-2), who has been hanging in there despite a bruised-and-battered right knee, triumphed over No. 4 maegashira Ikioi, who suffered his second straight loss after starting the tournament 7-0. After an uninspiring win the day before when he slyly dodged his opponent’s charge with a frowned-upon « henka » move, Goeido showed his best in a one-sided force-out win over yokozuna Kakuryu (7-2). 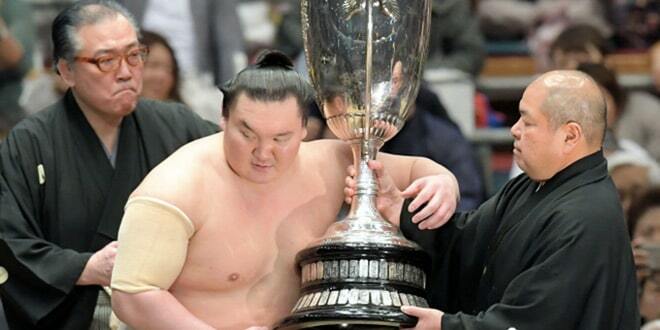 The victory left the ozeki one win back of Kisenosato, while ensuring his rank for the next tournament in May. 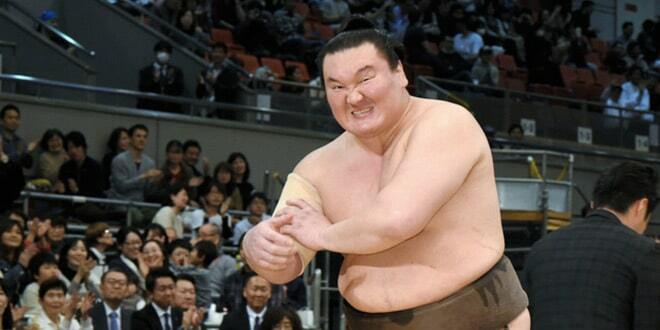 Despite being hobbled by injuries, ozeki Terunofuji (6-3) seized a crucial win over sekiwake Toyonoshima (1-8). Also a kadoban ozeki in need of a winning record to retain his rank, Terunofuji appeared physically unable to cope one day earlier. Although less than fit, the ozeki latched onto Toyonoshima and hung on for dear life before twisting down his opponent.